No pizza stone? No worries! Learn how to make pizza in a Dutch oven for perfect pizza baked in the oven, or even when camping! It all started when my pizza stones shattered during our move. That was nearly three years ago. I never bothered to replace them. I’m not sure why, exactly; I guess it’s one of those items that get bid to lowest priority, despite how much I relied on them once upon a time, from pizzas to rustic loaves of bread. But I did notice the difference when the carb cravings returned and I turned to baking again. Pizza crusts were never crispy enough, my loaves didn’t have that signature thud when you would tap on it, or the satisfying snap when you tore it in half. Until I realized I had a solution right under my nose. And it wasn’t ordering new stones from Amazon. My Dutch ovens! I cook with them every week, bubbling and braising, and my little aha moment: baking no-knead bread in it! If bread bakes beautifully in a Dutch oven, surely, I could get decent results with homemade pizza, right? 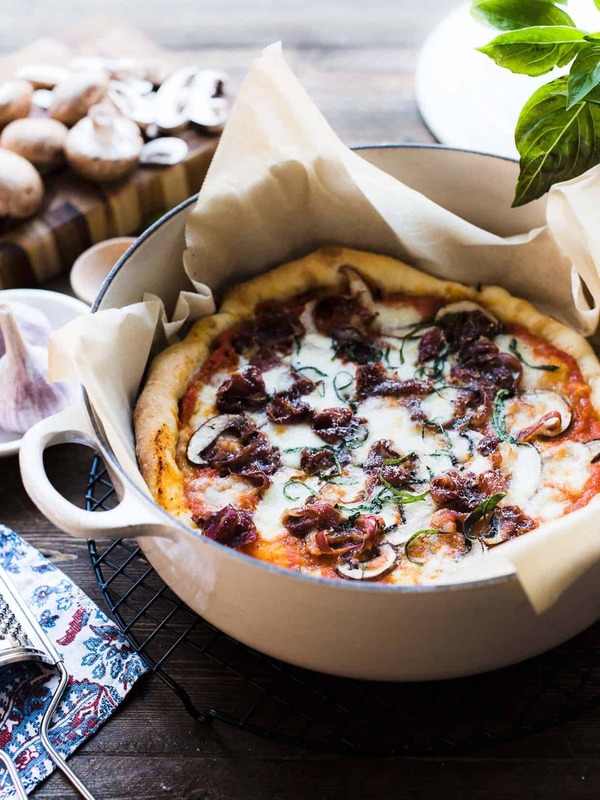 I’m so excited to share with you, that YES, if you have a Dutch oven, you’ll find that it’s the secret to perfect homemade pizza! It’s taken me a bit of practice to figure out the best way to transfer my pizzas into and out of the cast iron pot, so for this, I just rely on parchment paper. 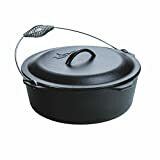 Using this and a small paddle, I am able to sling and lower the pizza into the preheated Dutch oven, nestling it into bake. But really, I find it very simple, and even easier to help retain that perfect circle shape! If you’ve ever tried to slide a stubborn pizza with a bit of sticky dough onto a baking stone, then you’ll know what I mean. 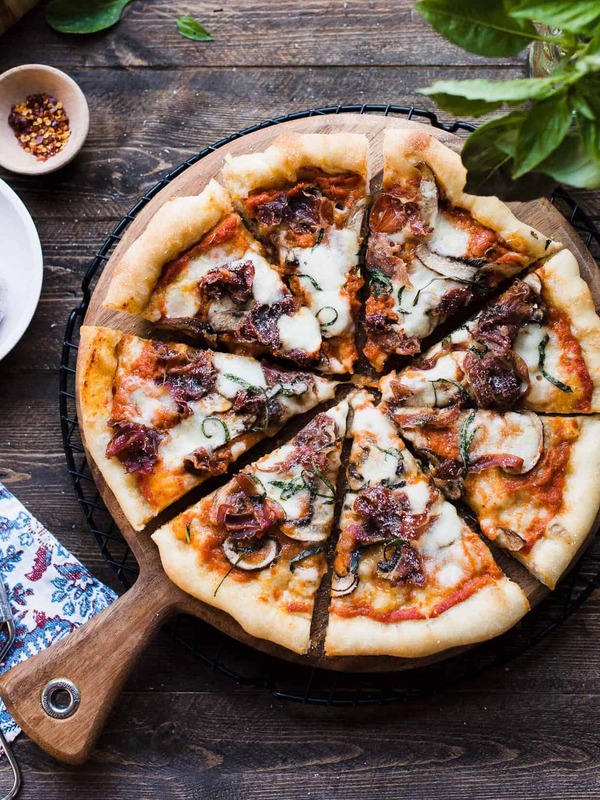 The thick cast iron proves a perfect surface for pizza to develop a crispy crust, the walls coaxing the cheese to melt over whatever toppings you wish. 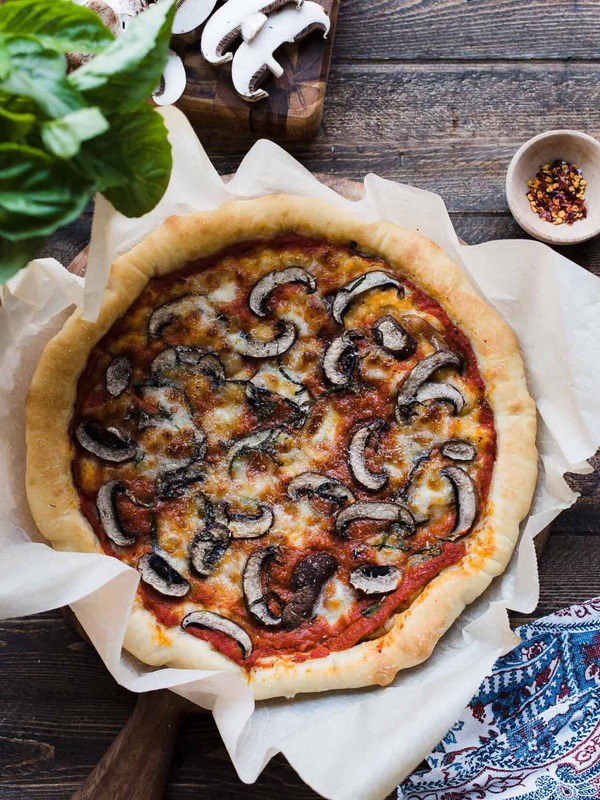 This has become my favorite way to make homemade pizza at home, and I know you will love it, too. P.S. If you’re going camping and have a cast iron, try this method out over your campfire! You will need to use your lid for this. Doesn’t campfire pizza sound much better thank franks and beans? Don’t get me wrong, I do love franks and beans, but…pizza! See notes for making campfire Dutch oven pizza in the recipe below. In the bowl of an electric mixer fitted with a paddle attachment or large capacity food processor with a dough attachment, whisk together the flour, sugar, salt and yeast. Add the olive oil and water, and mix until just combined. If using an electric mixer, replace the paddle attachment with a dough hook. Mix the dough until it comes away from the bowl and is smooth, then turn it out onto a lightly floured surface. Continue kneading the dough by hand until it is supple and passes the windowpane test. Divide the dough into three equal pieces, about 12-13 oz each, form into balls and place on a baking tray. Lightly brush with olive oil, cover with plastic wrap, and place in a warm spot to rise for about 1 1/2 hours. In the jar of a blender, puree the drained tomatoes. Transfer to a bowl. Stir in the grated garlic, salt, olive oil, sugar and pepper. Set aside or refrigerate until ready to use. Preheat the oven to 450°F with a Dutch oven on the lowest part of the oven. You do not need the lid. When the dough has doubled in size, roll the dough on a lightly floured surface. 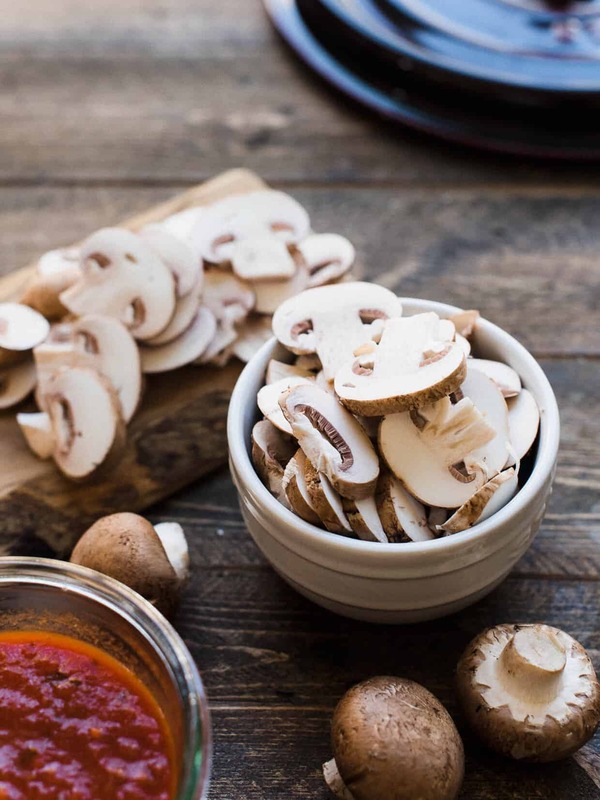 Roll it out into a disk about 12 inches wide (Keep in mind the diameter of your Dutch oven – for this reason, the larger the Dutch oven the better, especially if you prefer thin crust pizza. See notes below.). If you find your dough is bouncing back and not rolling out, let it rest a little longer. Transfer the dough to a piece of parchment paper. Let the dough rest for a few minutes more, then roll out a bit more if you wish. Lightly brush the dough with olive oil, then spread a third of the sauce in a thin layer. Top with your preferred toppings and cheese, then grate parmesan cheese on top. Using a small paddle or cutting board, bring the pizza over to the oven. Carefully guide the pizza into the Dutch oven by using the parchment paper as a sling and sliding it off the board into the pot. 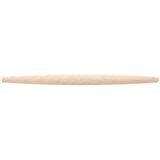 If you find that the edges aren’t laying flat, you can use a wooden spoon to coax it in. Bake for 12-15 minutes, until the crust is golden and crispy, and the cheese is melted. 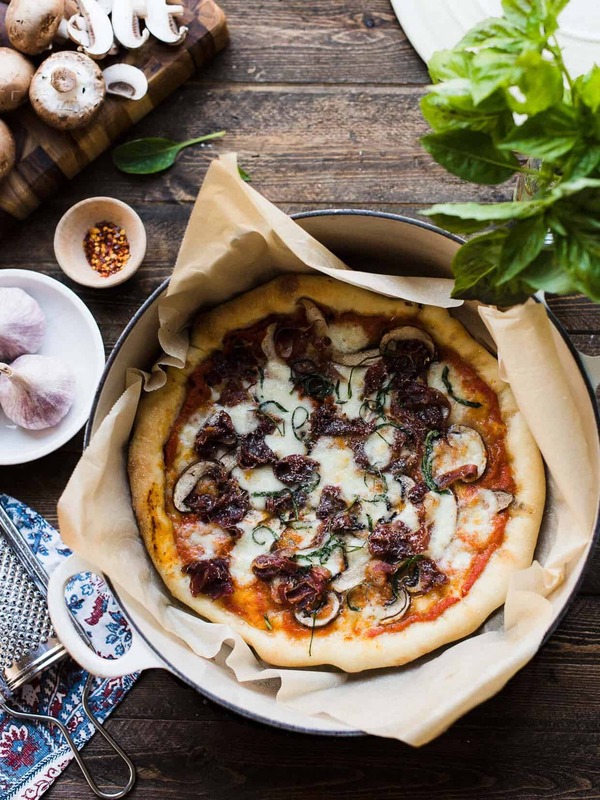 Remove Dutch oven from the oven and use the parchment paper to lift the pizza out and onto a cutting board. Return the Dutch oven to the oven for your next pizza. The process is essentially the same. 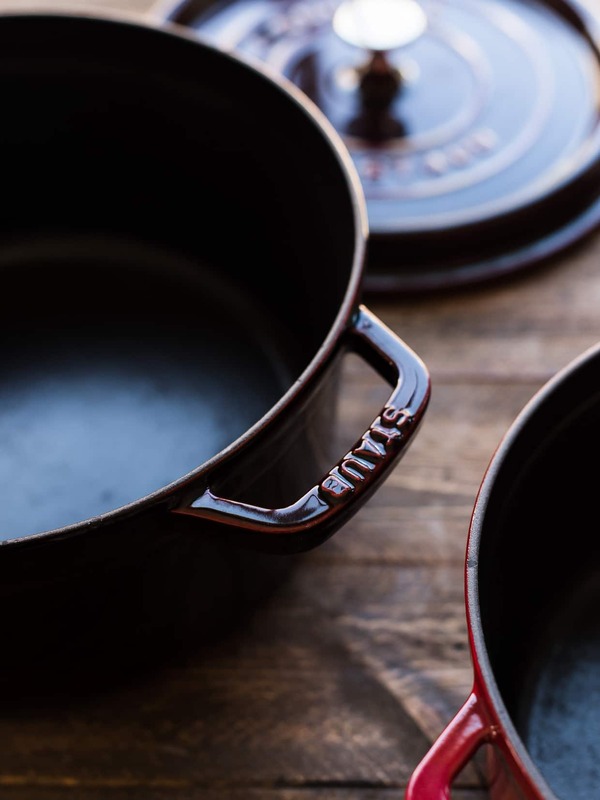 Preheat your dutch oven over a fire on a grate, or if you have a Dutch oven with legs, you can prepare it right in the coals. After you transfer your pizza into the Dutch oven, cover with the lid, leaving it open a crack to allow steam to escape. Baking time will vary, based on your heat, so allow about 30 minutes or so to bake. 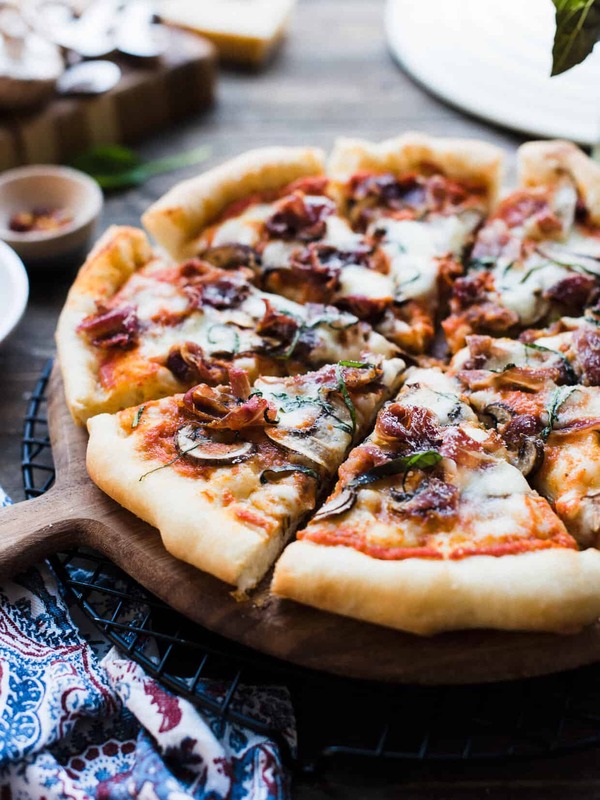 Keep in mind the diameter of your Dutch oven – for this reason, the larger the Dutch oven the better, especially if you prefer thin crust pizza. 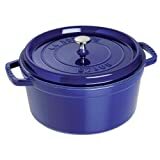 I like using a 9-quart Le Creuset #30. If your Dutch oven is smaller, simply divide the dough into smaller portions to fit your pot(s)! Pizza dough based on Basic New-York Style Pizza Dough recipe from Serious Eats. Maybe I should have read the post more carefully or looked at the picture with the piece of parchment paper. Oy…MONDAY. Liren, I love this idea. I have the super large Le Creuset and I am definitely going to give this recipe a try. I love the campfire pizza idea! Thank you very much for the recipe! The pizza looks so great!! !